At the start of the month, I ticked off destination number 6 of 12 as part of my #Leighs12in12 challenge after a whirlwind trip to Ibiza with four other blogging babes. I mean as soon as I was offered the opportunity to road trip across the Spanish island with Enterprise Rent-A-Car, I did absolutely not keep my cool at all... in fact, I pretty much started pre-planning my outfits in my head before I'd even discussed the finer details! Believe it or not, Ibiza is a destination I've been eying up the past year or so and it's not for the well-known, non-stop party scene. Granted, I love to drink and I love to dance (only when I drink, FYI), but I also like to be tucked up in bed before 1am and apparently that just isn't acceptable as part of the Ibizan party lifestyle. I've also heard the horror stories of being charged £15 for a bottle of water in a overbearingly hot club... no thank you! In fact I've been drawn to the quieter side of Ibiza; the white sand beaches, the incredible, rolling hill landscapes, the holistic yoga retreats, the crystal blue sea, the historic hippy quarters and the Instagram-worthy architecture. Sounds pretty dreamy, right? After a 3:30am wakeup call, I jumped on a coach to Stansted airport to meet the four other girls (Jaye, Lauren, Kelly & Jess) that I only knew via the internet or had only met briefly at events beforehand. There's something about press trips and blog events in general that can stir up a little social anxiety within me. I mean, I was about to be stuck with these girls for the next 72 hours straight, so it'd be pretty awkward if they didn't like me or we just didn't get along at all. Little did I know that just a few hours later that evening we'd be in our hotel wine, sharing wine and gushing about anything and everything, as if we'd been IRL friends for years. Growing up in London and living in the city, I've never learnt to drive. In fact, at the grand old age of twenty-six years old I still don't own a provisional driver's licence because I've never had the intention to learn. I suppose it could be down to laziness, but in all honesty I'm also a little terrified to be behind the wheel of a car. Needless to say, I've never been able to rent a car whilst on holiday and in the past I've 'made do' by travelling on foot or battling with public transport. This trip to Ibiza was the first time I've ever experienced the freedom and convenience of exploring a new country by car (thanks to our wonderful and patient driver, Jaye!) and it's really opened up my eyes to new possibilities when travelling abroad. In fact, it's inspired me to finally take the plunge and start learning to drive, just so I can start exploring by car when travelling abroad! We all know just how awkward it can sometimes be to trying to navigate public transport in a foreign country. Sometimes it can be a challenge trying to work out which ticket to purchase because of a language barrier, and sometimes you can end up jumping on the wrong train. Having a rental car to hand whilst on holiday means you don't have to worry about working out the maze of the metro or stressing whether you've found the right bus stop. As it happens when we were in Ibiza, I didn't notice one bus drive past us, so I'm not entirely convinced that there's a great public transport system in place on the island. It also means you don't have to rely upon paying for taxis, which can sometimes leave a hefty dent in your wallet. 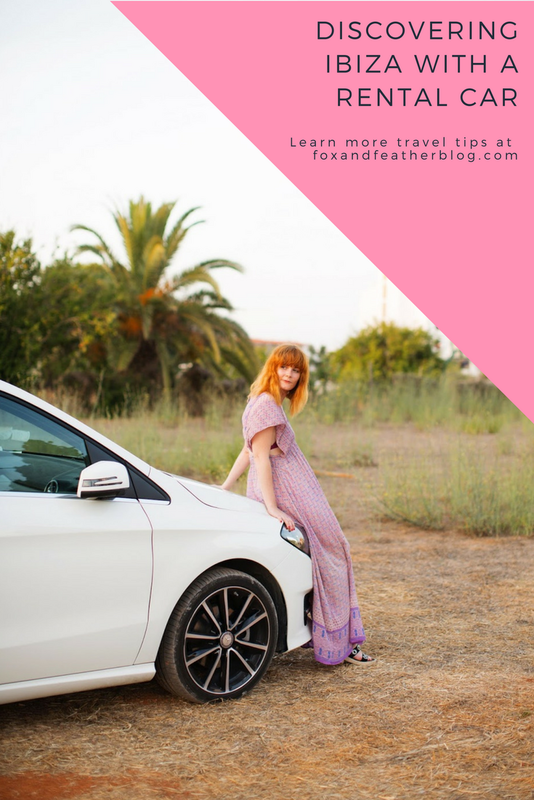 For places such as Ibiza, where taxi fares are notoriously expensive, a rental car can sometimes be the most budget-friendly option. It didn't take us long before we headed off-road in our trusty bright white Mercedes B-Class and came back with it absolutely covered in dust, so it began to resemble all of the other dust-covered cars across the island. In Ibiza we found a lot of the places that we wanted to visit were not accessible by public transport, including the viewpoint of Es Vedrà, and the rental car allowed us to visit spots that we would not have been able to experience otherwise. On our final night we visited the gorgeous Can Domingo Italian restaurant, which was so remote that we had to drive down a winding, dusty road into the hills. If it wasn't for our car, we would have never have been able to visit. Before jetting off, we all contributed towards an 'Ibiza Road Trip' Spotify playlist, so we could spend the longer journeys singing at the top of our lungs and getting in the spirit for our day of exploring the island. Obviously, we had the Vengaboy's "We're Going To Ibiza" right at the top of our playlist! The car also doubled up as great for a storage facility throughout the day. A trip with five bloggers meant various outfit changes throughout the day and rather than dragging everything around in an overloaded bag, we were able to leave our beach gear, extra bottles of water and extra outfits in the boot of the car. This made our journeys once we left the car a lot lighter and easier! The only thing I would not recommend is leaving any valuables, including cameras and laptops, inside the car just in case it's broken into and they're stolen. It's never worth risking leaving anything behind that you cannot afford to replace. Have you rented a car whilst abroad before? 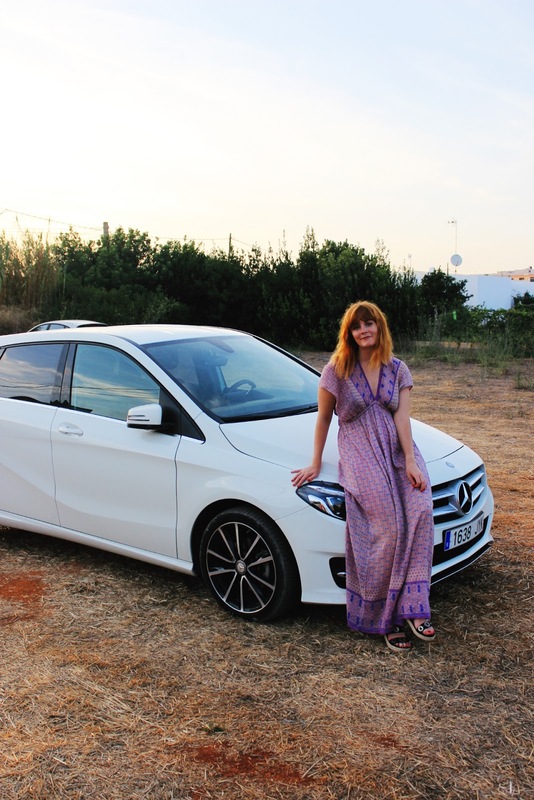 Disclaimer: I was invited to Ibiza by Enterprise & Talented Talkers who arranged our transport & trip in exchange for an honest blog post testing out their European rental cars. All words and opinions are my own entirely. Learning to drive really does make you feel so free. It took me five times to pass my test but I got there in the end! I just know it's going to take me forever to pass because my coordination and spacial awareness is terrible, but I've got to give it a go at some point - eek! It really is! It beats getting the bus or metro around a new place, for sure! We haven't rented a car abroad before but it is something we've considered. The quieter side of Ibiza!! I didn't even know that was a thing... but after reading about your experience, I may have to put Ibiza on my to-go list!! My husbands grandmother paid for my driving lessons and i will always be gratefull to her for doing so, the freedom it has given me and my family is immense. Renting a car must be much easier than relying on public transport when you go away! I've never driven abroad but I agree, it's a great way to see things off the beaten track.